James Taylor played his iconic hits. Steve Carell told edgy jokes. Halle Berry gave a heartfelt speech. Ford Motor Company Executive Director Bill Ford, Jr. accepted his Ambassador for Humanity Award from USC Shoah Foundation founder Steven Spielberg. And before you knew it, USC Shoah Foundation’s annual fundraising gala – held last year in Detroit – was a wrap. But it was hardly a stopover. More than a year after the 2015 event to honor that year’s chosen humanitarian for his leadership and corporate citizenry around education and community, the ties between USC Shoah Foundation and the Detroit community have never been stronger. At the root of the relationship is IWitness Detroit, kicked off during the gala, whose proceeds covered the costs. 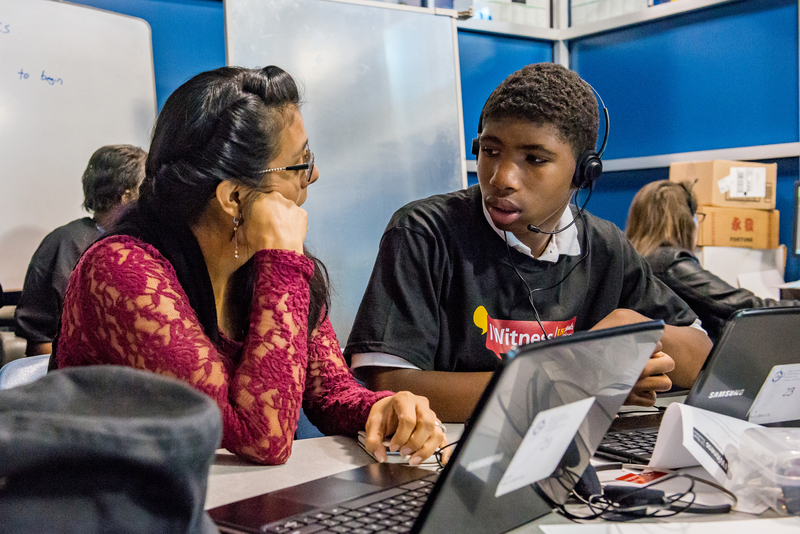 A two-year program, IWitness Detroit is essentially a push to permanently widen student access to IWitness, a free educational website from USC Shoah Foundation that uses testimonies – personal stories – from survivors and witnesses of genocide to teach students the importance of compassion and bringing about positive societal change. It will also serve as a model for bringing IWitness to other urban schools throughout the United States. As it happens, the Detroit initiative was timely. In June of 2016, Michigan became the sixth state in the nation to require middle and high schools to add lessons to the curriculum about the Holocaust – and the 12th to require instruction about the Armenian Genocide. The new law – as well as USC Shoah Foundation’s stepped-up presence in Detroit – comes at a time when shifting demographics and immigration patterns are stirring anxieties in the United States and around the world, adding urgency to the need for school programs that, like IWitness, counter hatred and intolerance while encouraging empathy and unity. Even before the September 2015 gala, USC Shoah Foundation was laying the groundwork for IWitness Detroit. Two months prior, USC Shoah Foundation staff flew from Los Angeles to Detroit to train educators. A month prior, staff members again came to Detroit to spend two days piloting a new IWitness activity about grit, determination and resilience called “Finding Your Seat on the Bus” with a group of students in cooperation with Henry Ford Museum. “Finding Your Seat on the Bus” covers the story of Rosa Parks, whose refusal in 1955 to give up her seat on a bus for a white person in Alabama energized the Civil Rights movement. The activity also incorporates several clips of testimonies from Holocaust survivors and liberators who discussed Civil Rights in their interviews. 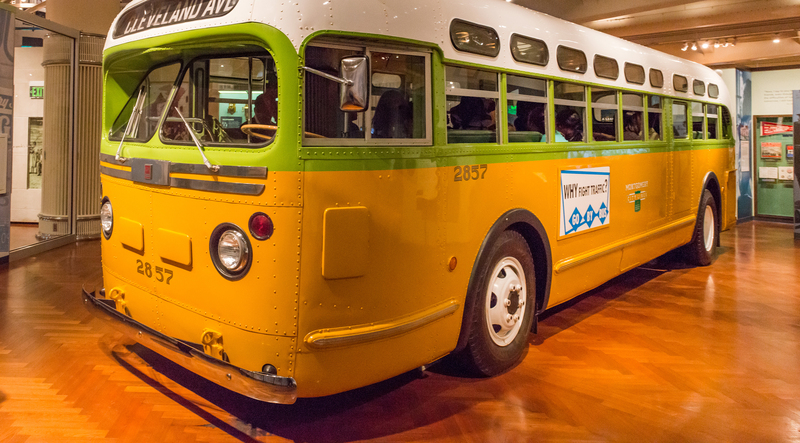 On the day of the gala in mid-September, 15 of the students who’d piloted IWitness’s “Finding Your Seat on the Bus” activity over the summer returned to Henry Ford Museum where the gala was held. 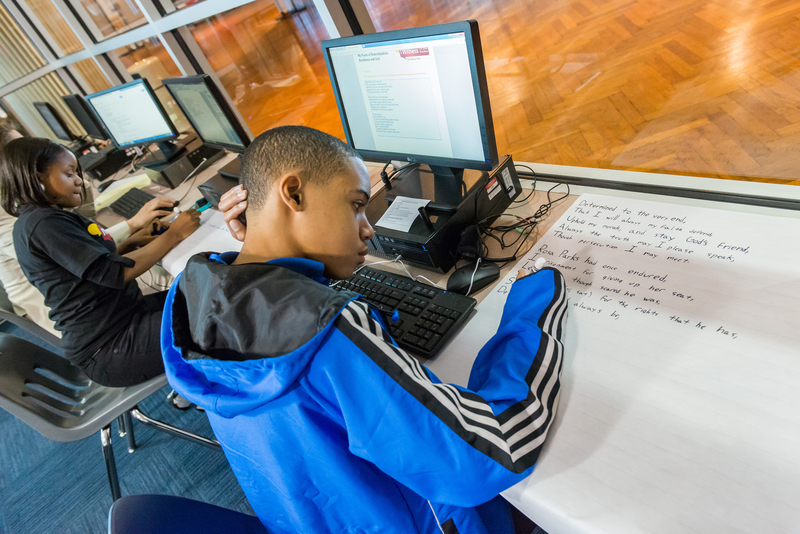 Working in a classroom at Henry Ford Academy – a charter school housed in the museum – they again completed the activity, which involves authoring a poem about goals, obstacles and determination. While concentrating on the project, the students were surprised by the arrival of a special guest: Steven Spielberg, founder of USC Shoah Foundation, who posed for a photo with the students and offered encouragement. Later that day, the students showcased their finished products for attendees of the gala. 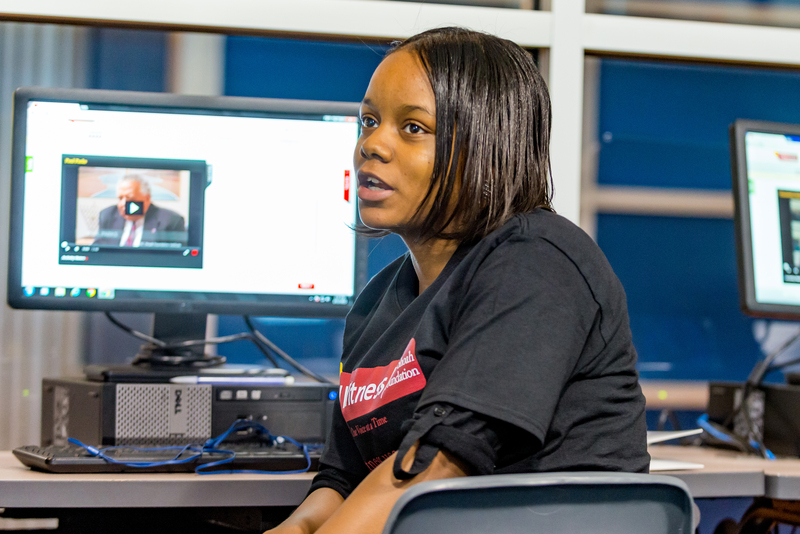 Since then, hundreds of middle- and high-school students from Greater Detroit have used IWitness on a regular basis. Dozens of teachers have been trained, and even more have signed up. 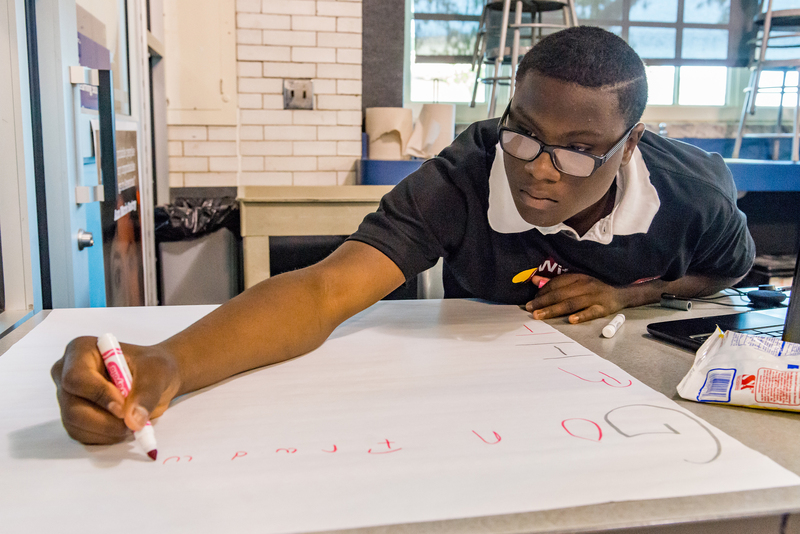 In mid-August of 2016, nearly a year after the gala, USC Shoah Foundation launched the ITeach Institute, a three-day seminar at the Holocaust Memorial Center in Farmington Hills, a Detroit suburb. 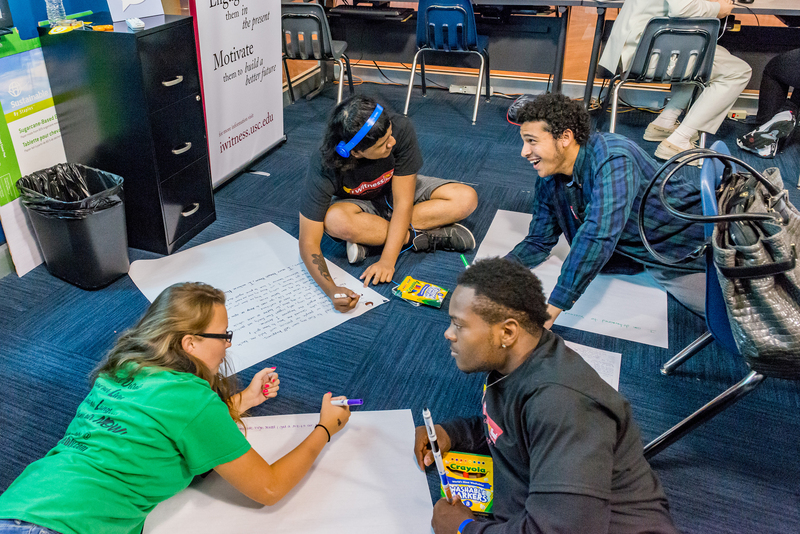 Teachers left the seminar with innovative, ready-to-use curriculum for their classrooms, including an exploration of tattoos in an English language arts classroom, as well as exploration of the undocumented student experience, the exploration of ghettos and the phenomenon of “white flight” in contemporary communities in a history classroom. Due to high demand, additional seminars have been scheduled in the region, including Macomb County, Oakland County and the city of Detroit. At a recent seminar, Brian Zezula, a world history/US history teacher at Clarkson High School in Independence Township near Detroit, said it’s important to disrupt students’ idea that if “everybody’s doing it,” there’s no reason to resist and do the right thing.